I have been craving fries for days but Im trying my best to stay away from fried foods. 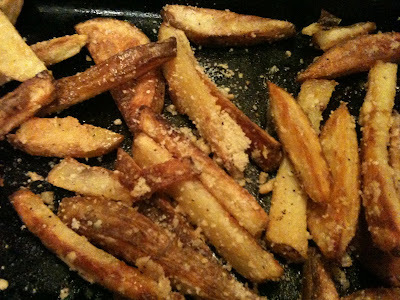 Last night I decided to try my hand at oven roasting fries. After looking around the net at various recipes I came up with this one. They are covered in bubbly parmesan cheese and have that nice bite of garlic. Make sure to scrap the little bits of cheesy garlic from the pan! 2. Cut potatoes into a medium size fry. You can peel them first but I dont. 6. Spread fries into a single layer on a cookie sheet or a baking stone. 8. When brown remove from oven Sprinkle with parmesan and garlic. Toss fries with tongs to coat them.